This photograph, taken around 1930 outside of Thurston County, shows the kinds of signs that reminded people to be careful of fire in the forest. 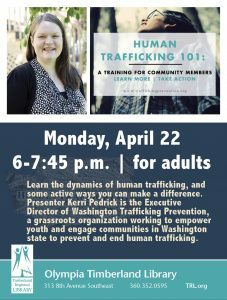 Photo courtesy: Washington State Digital Archives, General Subjects Photograph Collection, 1895-2005. In August 1905, a large fire started on the north edge of newly opened Priest Point Park, begun when a neighbor lost control of a burning pile of branches. It threatened to sweep across the city park. The park was saved, but the threat of wildfires and the need for wildfire prevention remains an important subject, especially with concerns about climate change. Fire is a natural visitor to the Pacific Northwest, where rainy winters and springs give way to hot and dry summers. Additionally, Native Americans traditionally burned the prairies of the Puget Sound region, preserving them from encroaching woodlands and encouraging the growth of camas, a staple of Native diet. With the arrival of the American timber industry, forest fire danger increased. Logged-off lands and second-growth timber are more susceptible to fire than established old growth forests. Additionally, timber companies typically burned “slashings” (waste tree branches and debris) to prevent fires, but these burnings often got out of control. 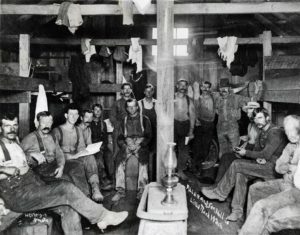 There was not much that early loggers and homesteaders could do to fight wildfires. Even with bucket brigades and wet bags, the best they could hope to accomplish was to contain fires and let them burn out on their own. A wildfire at Butler Cove in August 1897 was all too typical. Inhabitants of L.M. Hall’s summer cottages at the Cove packed up their boats to flee, barely able to hold back the flames. Wildfires were common near Little Rock and in the Black Hills, centers of logging in Thurston County. In an era with limited insurance, fire could bring economic devastation to farmers and logging companies. For example, a 1904 fire at Allen’s Mill near Little Rock burned several hundred cords of cedar shingle bolts, a staggering loss to company coffers. Fire was a common sight around the start of the 20th century. “Fanned by a brisk west wind,” reported the “Morning Olympian” newspaper on August 20, 1910, “the fire which has been raging west of the city [Olympia] over the past two days, late afternoon assumed alarming proportions and for a time it was feared that outlying homes on the Westside would be burned…the flames last evening lit up the whole of the Westside with a lurid glare, while wind carried bits of leaves, cinders and soot to all parts of the city.” Firemen of the city were busy all day putting out sparks. 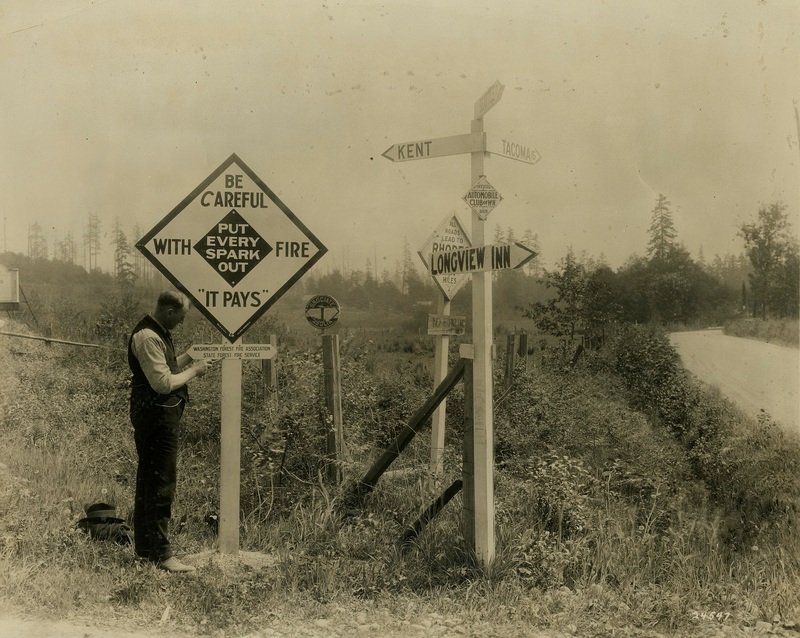 Attitudes about wildfires – and the ability to fight them – changed in the early 20th century. 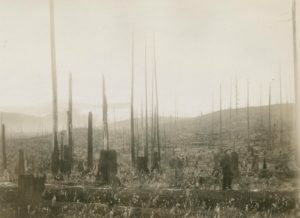 The September 1902 “Yacolt Burn” in southern Washington burned 370 square miles and destroyed $30 million in timber. This fire (the largest in Washington State history until the 2015 Okanogan Complex fire) galvanized public and industry opinion toward increased fire prevention and fighting. In 1905, the state legislature formed the State Board of Fire Commissioners, who appointed a state fire warden, who in turn appointed county fire wardens. Each county fire warden was in charge of organizing wildfire fighting in their county and running a system of patrolmen to monitor for fires on public lands. Thurston County’s first fire warden was Frank Donnelly. To further increase fire protection, private timber companies formed what became the Washington Forest Protection Association in 1908. Forest fires continued to cause huge losses for timber companies. In 1910, the “Big Burn” of more than 1,000 fires swept more than 3 million acres and killed 85 people, destroying entire towns in Idaho and Montana. Hundreds of fires also hit Washington that year. In 1917, the Forest Patrol Law required private forests to be patrolled for fires. Prevention and putting out all wildfires was their goal. Generations of students learned about fire prevention in schools. For example, as part of National Forest Protection Week in April 1922, Olympia students were taught how to care for campfires as part of civics lessons. Foresters tried other ways of publicity to raise awareness. In the 1930s, the Civilian Conservation Corps reforested the Black Hills and created truck roads to aid in forest fire protection. Aggressive firefighting began to fall out of favor in the 1960s, as ecologists argued that fire was natural and healthy for forests. Efforts against manmade fires and those that threaten structures continue to be prioritized but many lightning-caused fires in out of the way areas are allowed to burn. Instead of local loggers, the Department of Natural Resources coordinates and fights most wildfires in Washington State.